This beautiful silk scarf is an eco-printed, one of a kind, silk scarf with a lovely design of Oak leaves, maples and a few assorted others. The combination of natural tannin colors of copper, golds and greens come through the Natural imprints. A soft overlay of logwood and indigo created a watercolor like two tone effect of pale purple and blue! 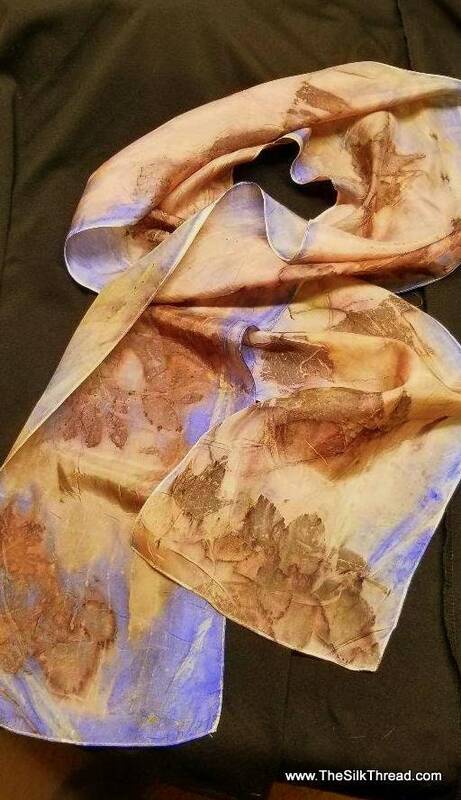 The scarf is 8" x 72" pure silk. My eco-friendly technique creates detailed shapes and colors of the actual plant matter that I use. Eco dyeing or botanical printing involves the foraging and collecting of Nature's leaves, plants, fruit and flowers to imprint on protein fibers. The all natural designs and colors are drawn directly from the plant matter. The colors you see in this silk are the actual colors released by Nature through my steaming process.